Hax showcases Lale Westvind's jagged, kinetic cartooning, and follows her clay-like figures as they battle their way through an electric, explosive, primary-coloured landscape. Hold onto your hats! There's an excellent review of it by "AJ", on Panel Patter, HERE. 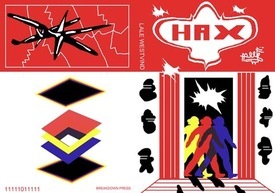 195 x 280mm -- 26 pages -- Risograph printed -- saddle stitched Please note: all copies of Hax feature some cover smudging. We've posted front and back covers along with a couple spreads HERE.